Now that I've been home from MDRS for a month, I want to pause and reflect upon the experience. 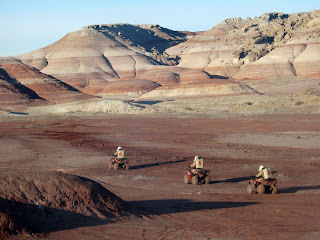 In particular, I want to compare MDRS to its sister Mars base FMARS, where I spent July of last year. I am now a member of a small club who can proudly say we have done a tour at each station, which are the only two mock Mars habitats in existence (for now). Physically, the two structures have similar dimensions and floor plans, each being about 8.8 meters in diameter by 7.7 meters tall. That's a size that could fit within a Saturn V or other proposed heavy lift rocket. The buildings have domed roofs sheltering enough living and workspace for 6-7 crewmembers on missions that have ranged from one week to four months in duration. 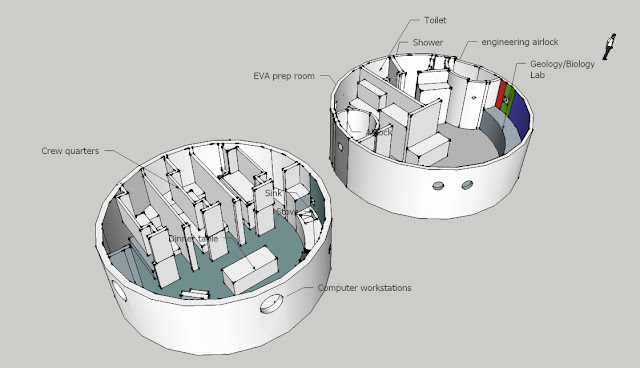 Each "Hab" contains a biology/geology laboratory, EVA preparation room, engineering storage/workshop, shower, toilet, and two airlocks on the first floor. The upper floor contains the 6 crewmember staterooms, a kitchen, work area, dining table, and an upper loft for storage. FMARS has a dedicated exercise area with a treadmill and bike, but MDRS does not. Below you can see a 3D rendering of the MDRS Hab interior courtesy of Diego Urbina of MDRS Crew 88. You may want to check out my video tour of FMARS and Crew 75's video tour of MDRS to get a better idea what the two Habs are like. 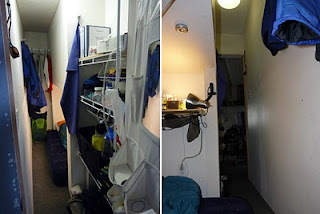 The photos below compare my bedrooms at FMARS (left) and MDRS (right). The MDRS room is larger and has a window because it's on the outside wall and is usually reserved for the mission Commander. FMARS was constructed out of strong pre-formed fiberglass panels and was flown to Devon Island via an Army C-130. After much drama involving a failed parachute that destroyed the original FMARS interior walls and construction crane, the structure was built by Mars Society and HMP volunteers in 2000. MDRS, on the other hand, was constructed out of more conventional building materials and was completed in 2002. This means that although FMARS is located in a more remote and harsh environment it has held up a little better than MDRS. MDRS's greater wear and tear could also be due to the fact that 92 crews have now called MDRS home, whereas only 12 have been to FMARS. A third larger Mars Society habitat called EuroMARS was built out of fiberglass in a manner similar to FMARS, but it was unfortunately destroyed in an accident before it could be sent to the field, but there are ambitious plans to revive it. The fourth planned Mars Society base called MarsOz has never gotten much out of the planning stages as far as I can tell. Since MDRS came after FMARS, it has some refinements that FMARS does not have. The airlock doors, for example, have some knobs and wheels on them that make them look more realistic. More importantly, the inner EVA airlock door has a window, something we wished the one at FMARS had. MDRS has real stairs (well, split stairs) leading to its upper floor, whereas FMARS just has a ladder. 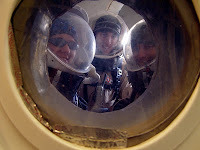 MDRS has a heating system with ducts throughout the Hab, but FMARS does not. 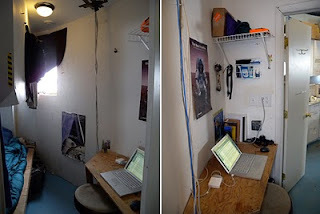 That makes for much warmer toilet and shower rooms at MDRS compared to FMARS. Some MDRS refinements actually enhance the Mars simulation experience by not forcing crewmembers to "break sim" as often as is required at FMARS. For example, at FMARS we had to fill the generator fuel tank every 8 hours to maintain constant power; at MDRS, the a big fuel tank is plumbed directly into the generator, making manual refueling unnecessary. Likewise, at FMARS we had to gather our own water from a stream about half a mile away and carry away gray water from the Hab. MDRS has its water delivered in a big 550 gallon tank that lasts at least two weeks, and gray water is recycled through the GreenHab. Finally, MDRS has a septic tank that means one can flush the toilet and not have to think too much about where the waste goes. FMARS has no such luxury, which is why we had collect all liquid and solid waste and either fly it off the island or incinerate it. MDRS has a physical "pressurized tunnel" connecting it to the GreenHab, which is a nice touch that maintains the feel of the simulation too. 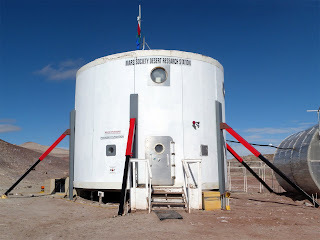 Since FMARS is more remote than MDRS, it has more tools and spare parts on site, making it more self-sufficient compared to MDRS, which is more dependent on outside support. FMARS is situated on the western rim of the Haughton Crater so the area resembles the brecciated, overturned terrain likely present over much of Mars. Plus, the heat from the impact event sterilized the area making it nearly devoid of life, also like Mars. Being in an Arctic region, the FMARS surroundings also have features like permafrost and polygonal terrain. MDRS also looks like Mars due to the red and brown hues in the sedimentary rocks that comprise the region. The local geology consists of various sedimentary and volcanic layers deposited in aqueous environments, which is similar to many areas of Mars. Both analog habitats are surrounded by chaotic canyon terrains similar Mars as well. 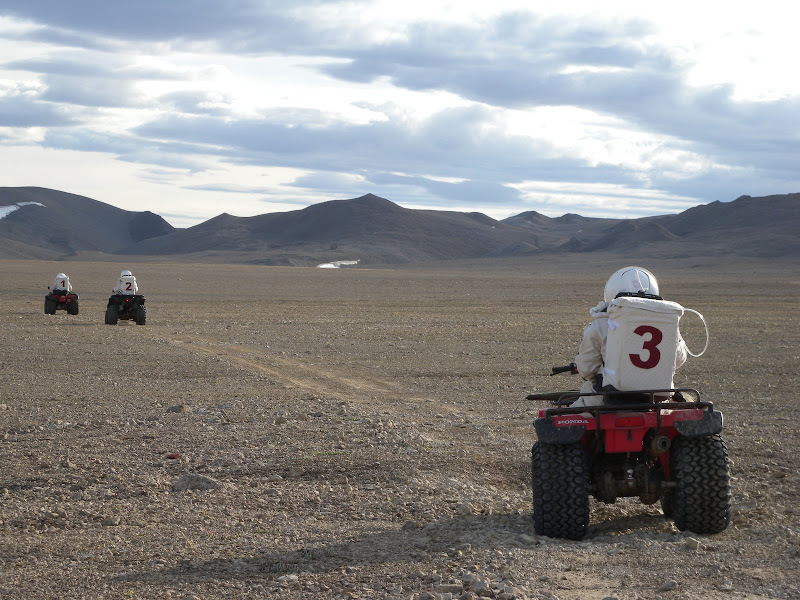 Below you can see us roving near FMARS (left) and MDRS (right). Despite both structures being located in desert environments, moisture buildup and mold are big problems at FMARS because the structure is so well-sealed. That's why dehumidifiers are absolutely necessary. MDRS, however, does not suffer from this problem at all and has very dry indoor air, which is perhaps a reflection that the structure allows for more air exchange with the outdoors compared to FMARS. Both Mars analog programs have similar operating procedures, but MDRS is overall more institutionalized. By this, I mean there are set procedures for what to do at MDRS, even if they change frequency. At FMARS, you tend to operate more by the seat of your pants. Mission Support is better geared to supporting MDRS since the have tools in place to manage the daily reports and photos. At FMARS, there is more improvisation. MDRS has a number of laminated signs inside telling crewmembers what to do (or not do) and how to operate some Hab systems. I wish FMARS had that. The Mars Society should do a better job at archiving the vast amount of reports, photos, video, and data collected on all of its simulated Mars missions. As it stands now, it is difficult for each crew to build upon previous crews' work because the information is not very accessible. I am very grateful to The Mars Society for choosing me for these two missions. I wouldn't trade the experiences for anything. The FMARS and MDRS bases provide a very good ways for crews to gain an experience analogous to a Mars mission. However, they can be considered "beta" versions of what a higher fidelity Mars simulation could be. 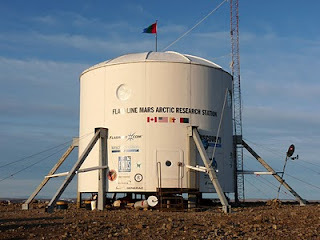 I have great hopes that the MMARS and/or Explore Mars initiatives will be successful in leveraging the lessons learned at FMARS and MDRS (good and bad) to construct a second generation mock Mars base that offers an even more realistic experience to provide better training opportunities for future travelers to analog Mars. This is an interesting comparison. 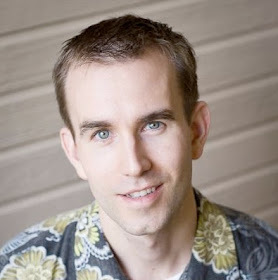 From following your blog, I could pick up on some of the differences myself but it is interesting to see them laid out. On a side note, as for the mold, wouldn't it be possible to install a ventilation fan, similar to what you see in a bathroom? You could put a hand crank on it if you didn't want to use up electricity. That is a good suggestion except that it would be "breaking sim" somewhat to purposely put a vent to the outside like you suggest. However, MDRS has just such a feature that I forgot to mention. It has a hatch in the center of the roof that can be opened for ventilation and for emergency escape. FMARS does not have that. Any ideas if you'll re-apply for either Hab in the future? My ramblings in this post are far from a comprehensive comparison of the two Habs, but you're right to point out the oversight of not mentioning the astronomy facilities at MDRS. FMARS does not have that. A question in my mind has been whether we'll have astronomical observatories on Mars during the pioneering phase there. I have no immediate plans to re-apply for missions to either Hab, but I wouldn't rule it out for the future. I have a suggestion that I didn't mention, I thought the difficulties with the quads could be solved with another type of arrangment. I was thinking that It could be worth trying a gyroscope type seating that could have other attachments hung around it's frame, it would be particularly useful if any of the other quads had mechanical problems and could probably carry another four people and baggage. The real benifit to the type of carrying would be a suspension which could actually be an improvement on the standard sitting on the seat of the vehicle. I haven't any plans to start a company building off world quads, so, perhaps the contributers of the science equipment would consider it. Awesome post... how many people have done both like you? It is amazing to me all that they cram into those "Habs." The CRIBS video was great, I had not seen that along the way when you were there! 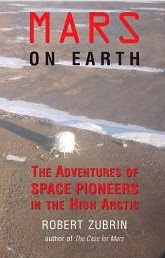 Kim Binsted's been to both FMARS and MDRC.